The company PEST IS OVER, situated in Thessaloniki, is highly active in the sector of pest control and disinfections. Having extensive experience, efficient and up-to-date equipment along with qualified staff and under the supervision of our executive director, Christos Delichristos, we resolve even the most demanding cases. The need for clean ambiance free of rodents and insects is nowadays an imperative. All spaces, however clean they are, can be easily infested and consequently infected by viruses and pathogenic organisms. For this reason, disinfesting or disinfecting regularly the space where we live or work is of utmost importance. Our company’s qualified staff visits your place* promptly and examines the problem as well as every possible source of infection. In this way, we are able to define the case we have to deal with and choose the method of its resolution (ecological or chemical). Moreover, using the floor plan of the building we indicate where the pesticides have been placed and we move on to create an archive for each application. In addition, depending on the findings, we visit the affected place for regular inspections. ​We combat effectively all kinds of insects; flying insects (flies, mosquitoes, fleas etc. ), crawling insects (cockroaches, ants, bedbugs etc. ), rodents (rats, mice), reptiles (snakes, lizards etc. ), mites and bacteria, always with respect to your space, the use of latest technology equipment and environmentally friendly formulations. More specifically, we undertake disinfestations, disinfections and rat extermination everywhere and in spaces with high demands in hygiene, as well. For instance, in food factories, restaurants, pastry shops, cafés, and in public places such as camps, schools, nurseries etc. 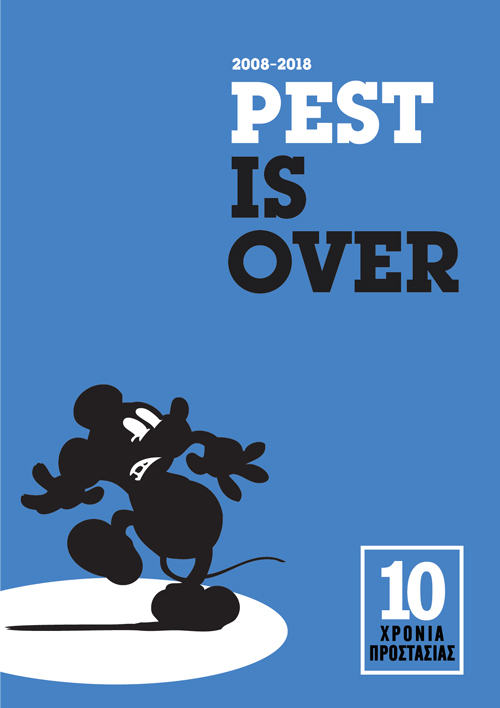 Trust PEST IS OVER and get rid of unwanted visitors! Enjoy a clean, healthy environment, free of viruses and harmful microorganisms that can put our health in danger. ISO 9001 Certification by an accreditation body proves our commitment to apply rigid quality standards. We are licensed by the Ministry of Agriculture. Thus, our efficiency and expertise are guaranteed. ​Under the supervision of our executive manager, a chemical engineer, we solve even the most demanding case. We exclusively use certified formulations that are both friendly towards the humans and the environment.